One day when I was out, my students used my duct tape to tape one another to chairs and uploaded a video of it to Facebook. During my first year of teaching, I had to be out for quite a lot of professional-development days during the school year. I was not an effective classroom manager my first year, and I taught several classes of students with behavioral disorders. The combination of these factors means that during much of my first year, I was plagued by DABOBLYSWAB, which stands for that feeling of Diarrhea-ish Awfulness Brought On By Leaving Your Students With a Sub. The good news, though, is that over the past several years, I’ve learned several things about preparing to be out when you’ve got a tough crowd of students. I’m proud to say that my DABOBLYSWAB has been almost entirely cured. In fact, I was out for a day this past week and received a near-perfect report from the sub, which almost made me cry, then made me skeptical for just a second, but then almost made me cry again. 1. First, understand that having a positive classroom culture can eliminate a LOT of the problems with students misbehaving for substitutes. If your students respect you (on a deep level, not one that is fear-based), there is a much greater chance they will behave for the substitute. If you and your students hate one another, don’t be at all surprised that when you leave your classroom, the substitute is terrorized. Think about it this way: Are you more likely to do a favor for a boss that you hate or one you deeply respect? If your class-teacher relationship is still a little shaky, don’t worry. There are still things you can do to help minimize DABOBLYSWAB! 2. Review policies and procedures with your students the day before you are out. Remind them of all your procedures, including bathroom policy, visiting the nurse, etc., and that you are leaving details of these procedures with the substitute, so there should be no reason for them to claim they have suddenly forgotten them. Some teachers have balked when I say I tell students in advance that I will be out, but I’ve found that if everyone knows the plan before I leave (instead of just me), I get a much better sub report. 3. Let students preview the assignments for when you’ll be gone. This has been huge in reducing student misbehavior during my absences. If you know you’re going to be out, hand out assignments to your students the day before you leave so that they can see the assignment, practice (without writing on it) and ask questions ahead of time. This eliminates the “I didn’t know how to do the assignment, so instead I decided to jump from desk to desk like a savage” excuse. Make sure you get the assignments back from the students after they preview them so your sub will have them for the next day. This eliminates the “I lost the assignment you gave us, so I decided to create a ceremonial fire in the center of your classroom and sacrifice all your office supplies” excuse. 4. Have a Pink Sheet. The Pink Sheet is my best friend for combatting DABOBLYSWAB. I created it the day after the duct tape incident and have never had a miserable sub experience since. Basically, the Pink Sheet is an organized, detailed way of getting feedback on student behavior while you’re out, AND it’s an incentive for students if they know they’ll receive a reward for a high Pink Sheet score. The great thing about the Pink Sheet is that my students will often ask the sub to update them on their score, especially if they see him/her writing on it. A friend of mine subbed for me last year and said my classes were constantly asking what score they were getting. If they were being a little too chatty, all she had to say was, “Oh, I think I might adjust your Pink Sheet score,” and they would straighten up. You can download an editable version of my Pink Sheet here! 5. Have a reward system in place. I tell students if they get a Pink Sheet score of 23 or higher, everyone in that class gets a random sticker from this book. (Think your students are too old/cool/tough to be thrilled about getting a sticker featuring a sweet potato or a mounted police officer? You’d be surprised.) I also give an Oreo to the students with the highest scores. If more than one class has a perfect Pink Sheet Score, I complain loudly about having to buy so many Oreos, which is, for some reason, even more of an incentive for them because my students are surprisingly schadenfreude-y little humans. If stickers and Oreos are personally or morally offensive to you, feel free to replace them with your own incentives, even if it’s a simple thank-you for good behavior. Important phone numbers/extensions (as well as how to dial extensions). Special student instructions (students who can be relied on to run errands, students who may need special assistance, etc.). A template of my sub letter can be downloaded here! Hooray! 7. If you’ve got a particularly tough crowd, arrange for a fellow teacher to check in on your students/substitute halfway through class. I would try to limit this, as it puts more work/responsibility on your teaching buddies. 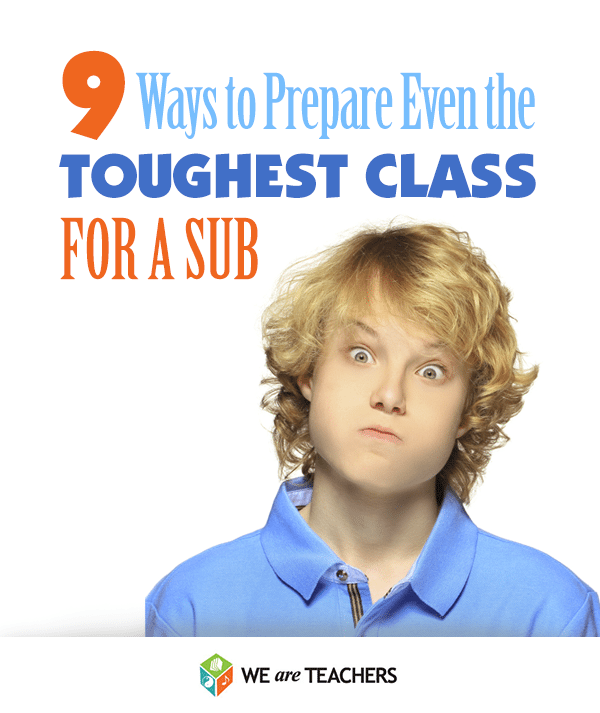 But if you’ve got a really tough class that you’re worried about, it can be effective. 8. Don’t leave new or difficult work for a substitute. The assignment doesn’t have to be easy per se, but the directions need to be clear, understandable and familiar. A day when you’re out is not the time to be introducing their senior thesis research project or doing a science experiment involving corrosive acids. any of the rules or procedures. any of the students or their behavioral idiosyncrasies. Knowing these things will help you prepare and will allow you to be more sensitive to things going less than perfectly. When in doubt, assign more, not less. If all your students finish the assignment in the first 15 minutes of class, it will make them a lot more difficult for a substitute to control. Have clear, realistic ideas in mind of what students should be doing when they are finished. Expecting a tough class to ALL be reading silently for 45 minutes after they’ve finished may not be realistic. I’ve discovered that allowing students the option of using personal technology but requiring them to stay seated is good for crowd control after they have completed their work. If you wish, tell your students ahead of time that one of the assignments or pages will be counted as a quiz grade. They will find out which assignment it is after you return. I don’t do this, since I don’t like being tricked as an adult and probably wouldn’t as a student, either, but maybe you could make it work for you. What are YOUR tricks to combat DOBOBLYSWAB? Love, Teach teaches English at a Title I middle school and writes about it at http://www.loveteachblog.com. In addition to teaching, she enjoys thinking about kittens and horrifying her mother by using the word “diarrhea” on public blog posts. You can follow Love, Teach on Facebook or Twitter (but she’s really bad at Twitter). Cheap and Easy Mother’s Day Crafts. GO!